The 2019 Oscars is officially off to the races, this time without an official emcee presiding over the annual ceremony. So since The Academy of Motion Picture Arts and Sciences typically relies on their hand-picked host to kick off the festivities, Sunday night's opening number was met with much anticipation. And with Queen and Adam Lambertin the driver's seat, it did not disappoint! As the curtain rose inside Hollywood's Dolby Theatre, the classic rock 'n' roll group (who has been fronted by the American Idol alum since 2011) brought attendees to their feet as they performed a medley of hits featured in Bohemian Rhapsody. From "We Will Rock You" to "We Are the Champions," it's safe to say there's never been an Academy Awards opener quite as electrifying. And yes, Jennifer Lopez, Lady Gagaand Glenn Close knew every word. Rami Malek portrayed the late frontman Freddie Mercury in the critically-acclaimed film, which is nominated for five awards, including Best Picture. 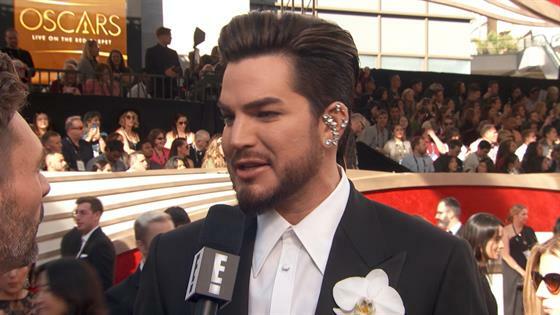 Prior to their performance, Lambert caught up with E! News on the red carpet and called the opportunity "mind blowing." "I'm so honored to be here," he gushed. "It's surreal. I lived in Los Angeles for 17 years and to open the Oscars, I never would have dreamed this is possible." Adam continued, "Queen and I have been working together for about six years. We've been traveling all over the world and we are performing this song in celebration of Bohemian Rhapsody and all of its nominations.... Everybody in the audience tonight worked really hard in their arts and in their craft and they all deserve to be here. So we're all celebrating together." Comedian Kevin Hart was initially set to host the Oscars, but he pulled out of the gig after past homophobic comments he made resurfaced online. The controversy cast a shadow over the ceremony, and weeks ago The Academy announced the Oscars would go on without a host for the first time in 30 years. Keep checking back to E! News throughout the evening for our complete Oscars coverage!